The people who lost their home are getting assistance from the Red Cross. 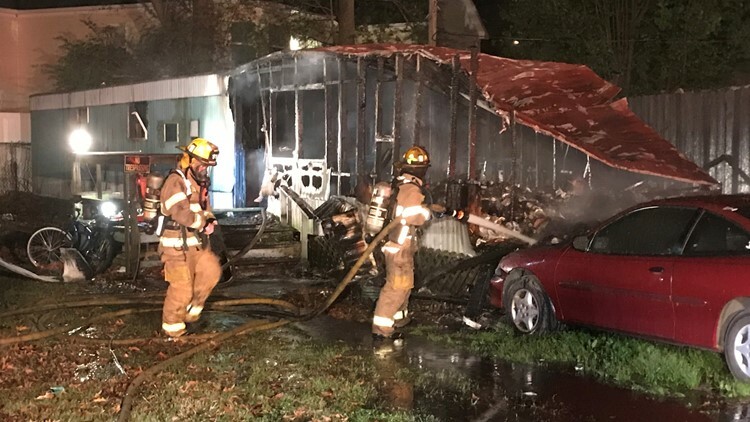 VIRGINIA BEACH, Va. — The Virginia Beach Fire Department responded to a mobile home fire early Monday morning. Emergency Communications received a call about the fire around 12:45 a.m. in the 900 block of Virginia Beach Boulevard. On the scene, fire units found the residence was well-involved threatening two other structures. Crews were able to get the fire under control by 1:07 a.m.
Two adults were displaced because of the fire, and two animals were found dead. There were no injuries to the occupants or Fire department members. Four engines, one ladders, one fire rescue, one ambulance, EMS Supervisor and three Chief Officers and Safety Officer responded 30 department members. The fire is currently under investigation. The Red Cross has been contacted to assist the residents.